here's another eye makeup tutorial and this time, using just two shades of eyeshadows. I decided to go for a creamy beige (Wet & Wild Brulee) for base and a shimmery pink-peach (MAC Sunset B.) on the crease. I opted not to use a brown shade for the crease as i wanted to give my eyes a pop of color. 3. Using a medium-sized blending brush (MAC 222) apply your crease color starting from the outer part of the lid up on the crease , following your natural eye contour and stopping before you reach the inner 1/3 of the lid. No swiper motion on this part of the application. 4. To get rid of harsh lines, use the same blending brush or a slightly bigger one (MAC 224), and swipe back and forth on the crease. 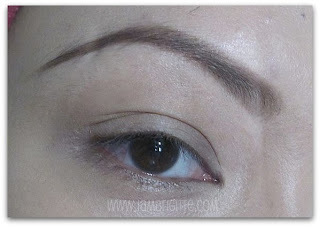 You can also blend the color upward by swiping the brush slightly higher than where you applied the crease color. 6. Curl your lashes (Shu Uemura lash curler) and apply two coats of mascara (Maybelline Stiletto mascara). you can use different shades of eyeshadows using this technique. it's easy and saves you (esp. me) a lot of time in doing eye makeup. i hope you like it and til next tutorial! I love how you did the winged liner! It's perfect! 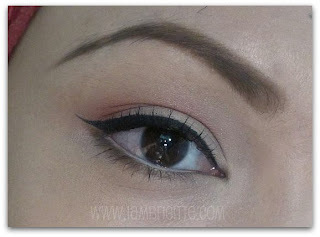 I agree with Crystal...galing mo mag eyeliner!